The Red Foundation started in 2017 – A team of Dachshund owners came across a un-spayed 18 month old female dachshund named Red being sold at a very low price, advertising the fact she was un-spayed. Unsettled by the idea of her going into puppy farming the team fundraised the money to buy and spay Red. 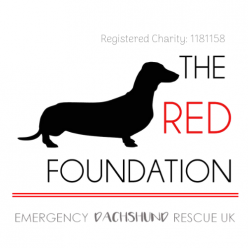 Seeing that this is now becoming a huge problem in the UK the team decided they could be doing more, so The Red Foundation has now become an emergency ongoing fundraiser to be able to get Dachshunds out of this situation more regularly along with accepting surrenders from current owners looking to re home their Dachshund responsibly. If you see any dachshund being advertised in this way or suspiciously please do contact us as we will try and help where we can or deem it appropriate to step in! We are also always looking for fosterers and adopters – Click here to find out more about applying to adopt or foster. All homes will be home checked and we stay in contact with our adopters for the life of the dog they adopt. There will always be an adoption fee per dog to cover costs. We are 100% non profit! Or by bank transfer and monthly standing order contact us for details.